We are an architecture studio formed by a multidisciplinary team of architects and designers, specialized in interior design and innovation through virtual reality. We are passionate about generating spaces that excite and transmit a unique and fresh essence. We work on the project to bring it to life, from its whole to the last detail. Based in Madrid, we carry out projects both nationally and internationally, either in person or online. Likewise, our collaborative and multidisciplinary vocation allows us to cover projects of different scopes and scales. We introduce virtual reality as an innovative architectural visualization tool, where you can live the experience in first person. Passionate about design, we are moved by the spaces with an attitude: vibrant, authentic and differentiating. Interactive architecture is called to be the new revolution in the architectural representation world and computer graphics (render). Nowadays, it is common to create static images of great realism with the objective of approaching the atmosphere of a space before its construction. The interactive architecture in real time and its implementation in virtual reality devices, allows us not only to observe the space before its construction, but also to walk, interact with light, change materials in real time… in short, to live your space before building it. Complement the virtual experience with a cinematic tour that enhances your space. Perfect for sharing with customers, individuals, or boosting your product in social networks such as Youtube or Facebook. 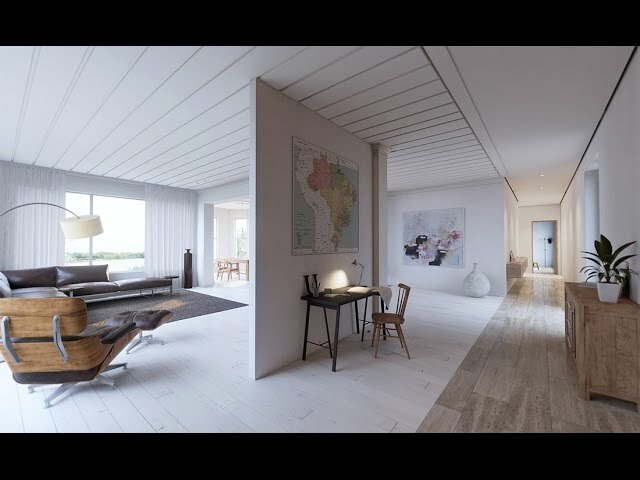 The realization of virtual show flats that allow you to live and interact with the space is a unique experience for your clients. Use the potential of virtual reality to stand out in events, fairs or brand promotions. The possibilities are unlimited, share your projects and ideas, and we will advise you. The ability to imitate existing materials with a high degree of realism allows us to create interactive catalogues where to combine and test materials in different environments. Bring your projects to life in virtual reality. Can you imagine being able to immerse yourself and interact with a photorealistic space in real time? A new range of possibilities is opening up in front of us. The future is here! Interact with the environment. Change materials, colors or lights with a simple gesture and in real time. Thanks to the technology offered by virtual reality glasses such as Oculus Rift, HTC Vive or Google Cardboard, you will be able to get into your projects and live them in first person. Explore the possibilities offered by virtual reality. Interior design projects, brand experiences, real estate development, architecture and much more. Download our “Casa Madrid” application totally free for Android, Desktop, or Virtual Reality. Enjoy a free tour of our property. Change materials by simply pressing the objects on the screen. Walk through the space using your mouse and keyboard, as if it were a video game. Available for Windows 10 x64bits. Live the space in the first person thanks to the Virtual Reality glasses, walk around the house as if you were in it and change the materials to your liking. Enjoy this promotional video of our house “Casa Madrid”. Do you want the same for your project? Contact us! Do not hesitate to contact us, we will be glad to answer any question. Thank you!